Dry your eyes, no tears, no sorrow. The music of the late ‘50s and early ‘60s when music was at that root level—that for me is meaningful music. The singers and musicians I grew up with transcend nostalgia—Buddy Holly and Johnny Ace are just as valid to me today as then. 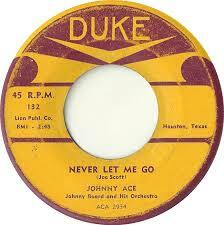 Never Let Me Go is a blues ballad song by American R&B/blues singer Johnny Ace, written by Joseph Scott and released in 1954 under Duke Records. The song is featured on the albums My Songs and Memorial “. Never Let Me Go” was one of his eighth consecutive top ten R&B hits in a row, including “My Song”, “Cross My Heart,” “Please Forgive Me,” “The Clock,” “Pledging My Love,” “Saving My Love for You,” and “Anymore”. The song was R&B hit and peaked to No. 9 in October 1954 on Billboards Rhythm & Blues Records chart. 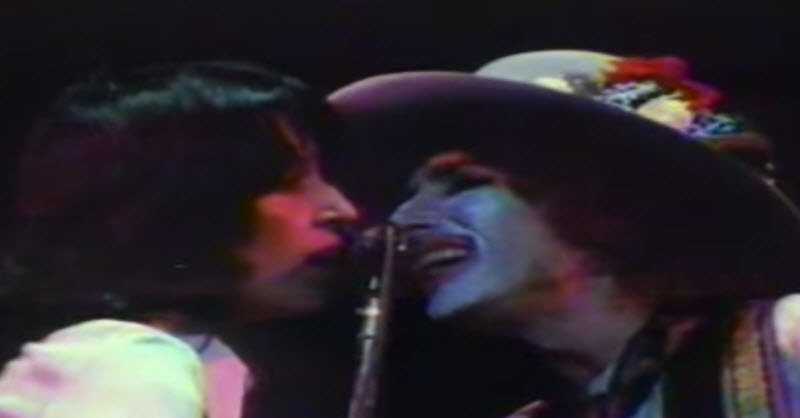 Never Let Me Go was performed as a duet by Bob Dylan and Joan Baez at 21 of 1975’s Rolling Thunder Revue shows. This video clip is from the movie “Renaldo & Clara“. A million times or more we said we’d never part. But lately I find you’re a stranger in my heart. To tell the world that you are mine. And never let me go, no, and never let me go. Love to hear Dylan and Baez together!